The Okavango Delta is a vast area of swamps and flooded grasslands that seasonally attracts large numbers of wildlife. It is an inland delta without an outlet to the sea. It is formed where the Okavango River reaches a tectonic trough in the central part of the endorheic basin of the Kalahari. The annual flood peaks between June and August, during Botswana's dry winter months. Then the delta swells to three times its permanent size, attracting animals from kilometres around and creating one of Africa's greatest concentrations of wildlife. The area is home to some 130 mammal species, such as white and black rhinoceros, elephant, cheetah, lion, leopard and lechwe antelope. The size of the populations is especially noteworthy. It is also an Important Bird Area. We visited the Okavango as long ago as Aug 1988. A review of that trip and comparison of it with what now appears on the Web for the area has identified things that have changed and things that have not! Hopefully the following will still provide some valid information and pointers for any WH enthusiasts thinking of visiting the area. No photo yet - my slide scanner isn’t working but, in all honesty, there are none of any great interest anyway! The first aspect to note is that Botswana has long targeted the upper end of the eco-tourism market – a trend which has multiplied since 1988 with massive increases in park fees and lodge tariffs. That is not to say that it is impossible to visit “cheaply” but, for the majority of people, a “full experience” visit to the Delta is going to involve a safari company, probably a flight in and out on a small plane and a stay at a “Luxury lodge” (though how “luxurious” it will be is another matter) and/or the rental of a 4x4! The easiest way to enter the inscribed areas from Maun by road is from the western side off the road up to Tsodilo and the “panhandle” (which I understand can now be done with a saloon car – unfortunately the road was very bad when we were there and we missed it out)- there are a number of "fishing lodges" along this road (though whether the game viewing is good is another matter!). Alternatively it can be entered from the Eastern side into Moremi Game Reserve – but only with a 4x4. Finally, you can make the "classic" entry by flying into a game lodge and travelling around once there by traditional wooden mokoro punted by a local guide. Some lodges also have motorised boats (and others have fibreglass mokoro!) and even 4x4 for nearby land-based safaris as well. Most lodges also offer the chance to do “on foot safaris”. Some lodges are in “private concessions” outside the Game Reserve but within the inscribed area. Other concessions are in the Game reserve itself – potential issues for these are first the fees, next that there could be more visitors in the area and finally that National Park travel restrictions (e.g no travel after dark) have to be observed. You “pays your money and you takes your choice”!! It is worth noting here that another great game viewing area in Northern Botswana is to be found in the nearby Chobe National Park (not included in this WHS) – and this could impact the sort of experience you decide to go for in the Okavango itself. The Western areas of this park (Savuti and Linyanti marshes) are accessible from Maun by 4x4 merely by "keeping straight on" for a few kms rather than turning left into Moremi!! It is also possible to enter Chobe by saloon car from the town of Kasane near the Zimbabwean border and visit only the eastern side known as Serondela where the tracks are adequate. We decided to fit in all 3 aspects by taking in the Okavango with a flight in/out to the central “wet” area but using a relatively down-market lodge and our own tent/food, next, W Chobe from Maun for a “classic” 4x4 land based experience with an experienced driver-guide and again using own tent and then, finally, returning to Francistown in our S African rent-a-car and then driving by excellent road up to Kasane where we were able to do a self-drive safari in the Serondela area. It is perhaps worth mentioning that you can also easily take in Victoria Falls from Kasane, though in those days we had to rent another car there as Zimbabwe wouldn’t allow in cars from, the then still apartheid, S Africa! So you will have to consider how best to allocate your time/money across all these options! How much on wet or dry areas, inside or outside the Game Reserve (but still inside the WHS), how much “luxury” you want from your lodge, flying or “roading” in, traditional mokoro or motorised boat, with or without an “on foot safari” etc etc! In making these decisions you need to consider why you want to visit the Parks and what sort of game viewing and related “relaxation periods” best suit your tastes and ambitions. We made all our arrangements on arrival at the nearest large town of Maun after driving up from Johannesburg – the difficult dirt road section of those days after Nata has long since been upgraded and Maun will, no doubt, have become even more of a tourist centre than it was then (although it still had a distinct frontier atmosphere and I remember we even got our saloon car stuck in the fine sand of the road from the town to the airport!). Some Web sites indicate that, at height of the season, such late arrangements as ours might not be easy nowadays. The value and uniqueness of the Okavango is undoubted but our experience is that the quality of Game viewing by Mokoro and on foot is rather limited compared with that available on a 4x4 in Chobe. The romantic “vision” of silent travel along the waterways with undisturbed viewing of a wide range of game is not, in our experience, the reality. Mokoro are set low in the water and are uncomfortable and “wet” (we had about 1 inch of freeboard!). A lot of your time will be spent surrounded by reeds. Animals have plenty of choices for “watering” and are not that visible. The main mammals we saw were huge herds of buffalo, a few elephant, some hippo, deer and crocodile (oh and some nice otter). Birding was quite good, particularly of course for water based species, but, apart from the occasional “speciality” still not better than that achievable using a vehicle across a range of habitats in the marshy areas of Chobe. Then there is the “foot safari”. These are likely to be available from your camp and during your mokoro trip. Yes, there is a certain “frisson” of excitement to be gained from “walking where the lions walk” and in viewing an elephant (at a distance) without the “protection” of a vehicle!! But again, in all honesty, your views will not be as good. Animals are used to vehicles as a “non harmful creature” and, with sensible behaviour on the part of driver and passengers, they need not be disturbed at all by them - and one can obviously approach a lot closer. Also, we are not ones to enjoy sitting on the veranda of our luxury tent soaking up the atmosphere/booze but prefer to be out on the trail, so that potential aspect of the “experience” is of no value to us – but “chacun a son gout”. We spent 3 days in the Delta - the arrival day, 1.5 days on the mokoro including an overnight in our tent away from the Lodge and an afternoon return flight to Maun. This was enough for us. I am glad we did it, but the best memories of Botswana relate to experiences gained during our motorised safaris by both 4x4 and self drive saloon in Chobe (and, on another self drive trip, in Kalahari-Gemsbok). These provided some of the best “plains” game viewing we have had in Africa (particularly of elephant and Lion) whilst the Okavango trip merely provided an interesting experience of an unusual habitat and eco-system. The quality of our photos on the respective parts of the trip tell the story. I was interested to note on the Web that the camp we chose in the Delta back in 1988 is still operating. It glorifies in the name of “Oddballs” and, in those far off days, operated at the “lower” end of the market with the “hippy” connotations of its name – and we even had our own tent there to reduce the cost still further! I remember looking around for the restaurant mentioned in the flyers and being told that, unfortunately, it was still just a “dream of the owner” – luckily we were self sufficient in food. I note that it is now called “Oddballs Palm Island Luxury Lodge” and that its high season rates are US $395 pppn!!!! This covers full board, mokoro trips and park fees (high in Botswana). Flights are extra. 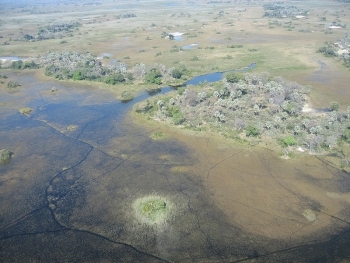 Oddballs is situated on Chief Island which is within the Moremi Game reserve but away from its “road accessible” areas. But the Reserve only represents 40% of the inscribed area and I noted this comment in IUCN’s AB “the whole of the nominated area (and the buffer zone) is communally-owned Tribal Land under the control of the Tawana Land Board. The Board leases a number of concession areas to safari operators”. Wiki comments that it “was named after Chief Moremi of the Batwanatribe. Moremi was designated as a Game Reserve, and not a National Park, when it was created. This designation meant local people, the Baswara or Bushmen lived there were allowed to stay in the reserve.” Yet IUCN also comments that it was informed “of the Government’s intention to upgrade the legal status of Moremi Game Reserve to National Park, and would encourage the State Party to consider National Park status for all, or most of, the nominated area.”. Quite where this would leave the inhabitants and the existing franchises it will be interesting to see. At the moment the camp franchises within and outside Moremi appear to be spread across a wide range of organisations whilst those in the Reserve have all been recently privatised – Botswana is determined to maximise its tourism revenue take and, no doubt ensure that its private investors (whoever they might be??) get a full share -with, hopefully, a good "trickle down". PS This link to a quote from Bradt's "Botswana" about the history of Oddballs' across the past 26 years since we were there provides a good indication of what has been happening to the tourism market in Botswana during this period and the Government's role in these changes with respect to the Okavango (see page 306): link. Fatal Accidents or 'disasters': On 14 October 2011, a Cessna 208 Caravan turboprop passenger aircraft operated by Moremi Air on a domestic flight from Xakanaka camp to Maun, Botswana, crashed and caught fire shortly after take-off, killing eight of the twelve people on board.